Classic chukka comfort and style with a rugged twist! 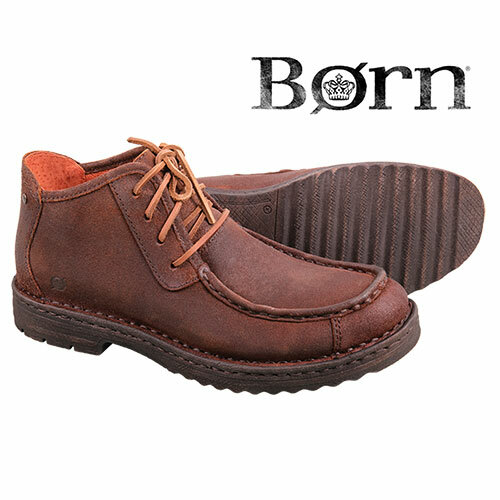 These Born chukkas were designed to take you places where ordinary chukkas fear to tread. They feature a rugged EVON plus rubber-like sole that can handle wet, sloppy and muddy conditions plus a durable full-grain leather upper. Plus they feature Born's Opanka hand-sewn construction where the upper, sock lining and outsole are sewn together for comfort. Also features foot-pampering cushioned footbed, lace-up closure and leather linings. Color: Brown. Mens size 12.